Exactly one month ago, I revealed my entries for the June 2010 Photo Hunt here. This morning, the August 2010 Photo Hunt items were released. I fully plan on participating and signed up this morning. If you’d like to join me, click on the link above (or click the big button at the top) and add your blog and/or flickr photostream. 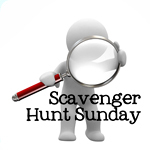 To encourage participation, one item from the list will be selected for Scavenger Hunt Sunday each week. Photos should be taken between August 1st and August 31st. You may use a maximum of two photos from your archives — as long as they were taken within the past year — if you find yourself stuck on the 31st without having a photo for a category or two. It is up to you whether you post your photos on your blog as you go or wait until September 1st to unveil them and make it a surprise. Put all 20 photos in one single blog post or in a single online gallery by September 4th. Please label each photo file in the following manner: Yourname-category.jpg (ex: kristi-something musical.jpg). I hope you’ll join me in the hunt! Enjoy the rest of your weekend – I’m off to California.